While some features and placements in both Ardabil carpets (Victoria & Albert Museum in London and Los Angeles County Museum of Art) are phenomenally duplicated, it is in knot count, texture, and pile length, curiously enough that significant and puzzling differences are found. In the London Work, there are 17-18 hand-tied asymmetrical (Persian or Seneh) knots to the linear inch, whereas the Los Angeles carpet averages 19-20. This results in an approximate count of 297 to 324 knots per square inch in the Ardabil of London, and 380 to 420 knots to the square inch in the Los Angeles pendant. This discrepancy may rule out conjecture that the carpets were woven simultaneously, although they bear the same date. Burton B. Fredericksen, the curator of J. Paul Getty Museum believed that the finer weaving of the Los Angeles Ardabil makes it the older of the pair. TICKET INFO: FREE tickets will be available ONE HOUR prior to the start of the show at the LACMA box office, starting at 6 p.m. Show starts at 7. Your RSVP on Farhang.org doesn't guarantee tickets. Three of Iran’s most creative and innovative artists present an evening celebrating their rich Persian heritage and the cultural roots they draw upon. Singer Mamak Khadem seeks to explore the intersections of Eastern and Western musical traditions. By collaborating with traditional performers from Iran as well as world-aware instrumentalists from the West, Mamak hopes to inspire people from around the world, particularly the young, to contemplate, observe, and celebrate the value of Persian heritage. Producer - Composer Hamid Saeidi & Choreographer Shida Pegahi present the premiere of Imaginary Knots, a multimedia production exploring the cultural origins of Persian Carpets. 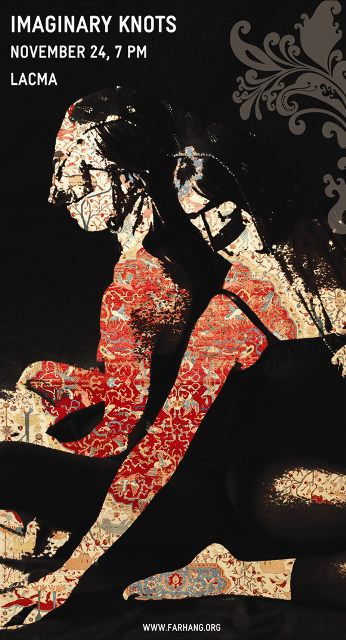 Like an intricate silk carpet, this multimedia project weaves live music, dance and video art as it explores aspects of Persian culture. This afternoon, I went to Los Angeles County Museum of Art with my wife and my younger son Kash to see the famous Ardabil and Coronation carpets. Both rugs looked amazing. If they could speak, they would tell us many sad and happy stories they have witnessed through all these long years. The Ardabil carpet was put on display on a big one-foot high orange-red table on the floor. It looked beautiful. There was not that much information published on the wall. We asked the tired and unmotivated guard to see if they had any flyer, brochure or exhibition catalog and he said they did not have any. This was also the case for the magnificent Coronation carpet which was on display in the adjacent hall. Few visitors were in the halls. I expected to see more people. The coronation carpet is worn out more than the Ardabil carpet. It might have been more in use than the Ardabil. However, the Coronation carpet has less repair with less damage. There is a chance that like the Ardabil, this rug has also a mate. But no one has ever seen or mentioned such a theory and possibility. I went to the museum's bookstore to see if they had pictures or books on Ardabil and coronation carpets to sell. They did not have any. 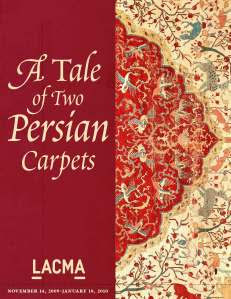 I am planning to go to LACMA again tomorrow to see the carpets again. I love to take this opportunity to see these two wonderful rugs as many times as I can. Thanks to Farhang Foundation, a non-profit organization in southern California which has partnered with Los Angeles County Museum of Art to promote this event and make it more possible for the visitors to see these two rugs. When the V&A Museum acquired this Ardabil carpet in the 1950s, they cleaned it, repaired it and hung it in a three-fold frame. It was displayed in a glass gallery where it remained for about 20 years. Unfortunately, this was not enough for a carpet of this magnitude and importance. Signs of damage were beginning to appear and it was incredibly dirty after all those years. It was obvious that a lot of work needed to be done in order to display the carpet in all its glory. One of the first things the museum did was send the carpet to a facility in Alabama. While there, the carpet was washed on a special ramp, using fresh mountain water that contained very few minerals and chlorine. Then it was attached to special sheeting that provided support. These changes kept the carpet in good condition for about 30 years. But the museum knew that to really display the carpet in the very best light, it had to be viewed on the floor. This proved to be a challenge for the museum, but eventually, the carpet was placed on the floor and encased in glass for all to see. Containing quintessential design, extensive creativity and, not to mention, a remarkable place in history, the Ardabil carpets are easily differentiated from any other. Although these carpets are centuries old, have traveled to a variety of locations and even experienced damage as the result of an earthquake, they still possess the incomparable beauty that's all their own. However, in order to maintain such beauty, museums have to be very careful and extremely specific when caring for, and also displaying these carpets. Considered one of the museum's most important pieces of art, the Ardabil is meticulously maintained. This is the Ardabil carpet that lost its border in order to help restore the other Ardabil in London, it is extremely delicate. There were many repairs that had to be made. When a new border was added to the carpet, this weakened the original carpet fibers, since different dyeing and processing methods were used. In addition, due to previous cleaning processes, the carpet was experiencing small rips and tears each time it was unrolled, and the museum owners put it at risk each time it was displayed. The staff at the Los Angeles County Museum of Art was so concerned with keeping the carpet true to its original glory that they sent it off to the Historic Royal Palaces Textile Conservation Studios at Hampton Court Palace, near London, to have it cleaned. Because of the carpets massive size, this was one of the few places that had a table big enough to hold the carpet in a safe manner. For nine months, The Los Angeles County Museum of Art worked closely with the Historic Royal Palaces Textile Conservation Studios to develop a safe cleaning product for the carpet. In addition, they added strong fabrics to the back of the carpet for better support when unrolling it. What Makes Ardabil Carpets So Valuable and Unique? Nothing says luxury and elegance like a fine carpet. And for those looking for the highest in caliber and design, the only option is to purchase an Iranian carpet. This is because Iranian carpets contain the essence of what a fine carpet is supposed to be. For example, the famed Ardabil carpets are perfect examples of perfection. From their vast details to their creative weaving design, these carpets are some of the most sought-after carpets in the world. Even though they are housed in two separate museums, numerous visitors travel long and far to get their eyes on these historical carpets. There are a variety of factors that make these carpets so unique. Created 470 years ago, the Ardabil carpets have a long history. They were created for the shrine of Sufi leader, Sheikh Safi. And although that shrine was the home of both of the carpets for more than 300 years, various circumstances resulted in their separation. The carpets were bought and sold numerous times before ending up in American and English museums. The interesting thing is that these carpets were so valuable, people tried to pass off copies as originals. 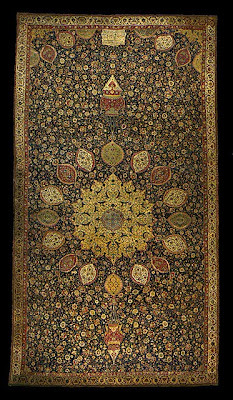 For example, it is said that there was an Ardabil carpet at 10 Downing Street. In addition, even Hitler claimed to have owned an Ardabil carpet in his office. 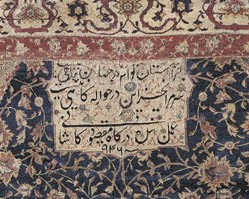 Work of a servant of the court, Maqsud of Kashan, [in] the year 946 [1539-40]"
The fact that these carpets include poetry from Persian lyric poet, Hāfez (1315-1390), is simply amazing and another great thing that makes Ardabil carpets one of a kind. Shah Tahmasp wanted these carpets created for the shrine of his ancestor, Sheikh Safi, so it is without a doubt that they had to be perfect. Defining parts of these Ardabil carpets include complex design and scrollwork. The carpets consist of asymmetric (Persian) knots, roughly 518.000 knots per square meter, silk and wool. In addition to a big, yellow medallion in the center, with two lamps on either side, the bulk of the carpets have in-depth scrollwork located in the main section of the carpets – the blue background. This includes flowers, leaves and other greenery intertwined together. Besides their remarkable beauty, the main reason why these carpets were praised so much is because there was knowledge of only one at the time of discovery. The carpet received the highest compliment from one very notable British designer and artist named William Morris. He called the carpet, among other things, "a remarkable work of art…its design is of singular perfection…"
With such praise and demand for the Ardabil carpets, it's obvious why these carpets are of such high value and rivaled by no other. The city of Ardabil, located in northwest Iran, is said to be where the Ardabil carpets were first created. Although this area has become famous for the birthplace of the Ardabil carpets, it is also the shrine of Sufi leader and mystic, Sheikh Safi. During his lifetime, Sheikh Safi originated a dervish order at Ardabil. Followers were very loyal to Sheikh Safi, and years after his death in 1334, the area was taken over in 1501 by Shah Isma'il, one of Sheikh Safi's descendents. Shah Isma'il founded the Safavid Dynasty, united Iran and was also responsible for implementing Shi'ite Islam as the Safavid state religion. During this time, Shah Isma'il encouraged people to travel to Shaykh Safi's shrine in Ardabil. In addition, Shah Isma'il's son, Shah Tahmasp, increased the size of Sheikh Safi's shrine and also put in the order for the now famous Ardabil carpets to be made. It is said that this was Shah Tahmasp's way of praising the Safavid dynasty. Before Safavid rule, carpet weaving was considered a relatively unsophisticated skill. 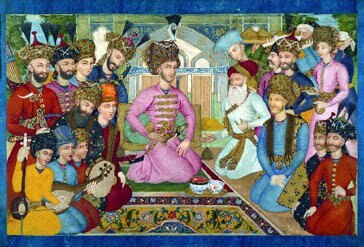 However, it is said that Shah Tahmasp was a great supporter of the arts. And it is during this era that a variety of artistic specialites flourished, such as tile making, book binding, pottery making and, more specifically, carpet weaving. 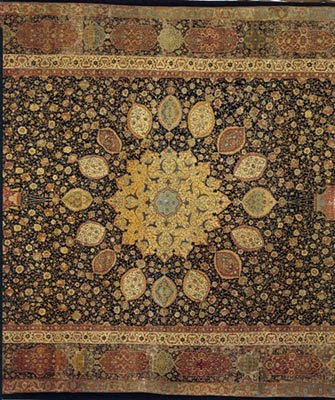 An entire movement developed around carpet weaving, both nationwide and internationally, resulting in the construction of many royal workshops by Safavid rulers. These carpets were not just any carpets, but were considered as some of the best examples of carpet weaving. They were made with exceptional detail and striking characteristics. In addition to a large center medallion and two lamps above and below the medallion, the two, identical carpets contain an assortment of colors and are dominated by one complex design. This design includes an array of flowers, leaves and vines. It is said that the carpets took three to four years to complete and involved the hard work and dedication of up to 10 weavers. Additionally, carpet weaving was usually performed by women, but because of such an important task of weaving the Ardabil carpets for royalty, it is speculated that men were also involved. For more than 200 years, the Safavid Dynasty ruled and it goes to show that the Ardabil carpets were a part of a very prominent time in history. Religion, politics and culture in Iran were experiencing a dynamic metamorphosis. At the same time, an artistic awakening was also in progress. As a result, two spectacular and highly regarded carpets were created and, to this day, continue to hold enormous historical significance. In addition to their beauty, incomparable qualities and dynamic place in history, Ardabil carpets have also been put in the hands of many people throughout their long existence. For more than 300 years, the carpets were located in a shrine in the city of Ardabil in northwest Iran. However, an earthquake in the late 19th century damaged the shrine and the carpets. This resulted in a chain reaction of events that would change the history of the Ardabil carpets forever. It is said that about 30 years before the earthquake, English visitors caught their initial glimpse of the carpets. Speculation says this may be the reason why the English were the first to purchase the carpets. Furthermore, it has been reported that possible reasons for selling the carpets to the English were to help cover the costs of repairs. Nevertheless, the English carpet trading company, Ziegler & Co. bought the damaged carpets. Even though both needed repair, the only logical thing to do at the time was to take various pieces of one and use them to help restore the other. This resulted in one large carpet (in Victoria & Albert Museum in London) and another smaller, borderless carpet kept in Los Angeles Museum of Art. Approximately, in 1891, Vincent Robinson & Co. of London received the carpet from Ziegler & Co., and then Vincent Robinson & Co. put the carpet on public exhibition. The fact that the Ardabil carpet was hundreds of years old, contained an authentic inscription and had a one-of-a-kind existence, it gained much praise from popular newspapers and prominent community figures. Even the famed artist, designer and painter, William Morris was in awe. He was so impressed with the carpet that he aggressively worked to obtain the carpet for the Victoria & Albert Museum in London – where it currently resides today. A few years later, it was rumored that there was another Ardabil carpet in existence. So in order to help sustain the value of the larger carpet, Vincent Robinson & Co. secretly sold the smaller carpet to Charles Tyson Yerkes, a wealthy American collector whose reputation was a bit questionable. Regardless, the goal was to keep the existence of a second carpet concealed, which meant Yerkes had to make sure the carpet never made its way back to England. 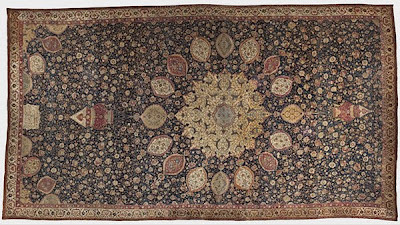 However, by 1910, Yerkes' entire collection of carpets, including the smaller Ardabil, was auctioned off. 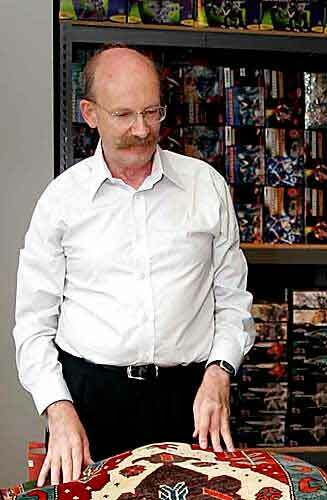 As a result, Dutch immigrant Joseph R. De Lamar bought the "secret" Ardabil carpet. Eight years later, well-known London art dealer, Sir Joseph Duveen, purchased the Ardabil after De Lamar's estate was sold. About 20 years later, J. Paul Getty bought the carpet from Duveen, and later gave it to the Los Angeles County Museum of Art, where it has remained for past several decades. Los Angeles is getting ready for the Ardabil and Coronation carpets. Now a days, you can see the pole banners of Los Angeles County Museum of Art on all major streets of Los Angeles on "A Tale of Two Persian Carpets". These beautiful and wonderful objects of art and masterpieces will be on display on November 14, 2009, next Saturday. Don't miss this one in years time opportunity. 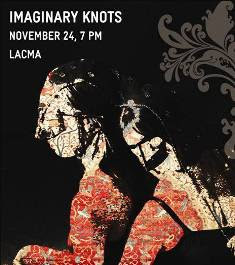 Farhang Foundation, together with the Los Angeles County Museum of Art announced the premiere of Imaginary Knots; Celebrating the Cultural Origins of Persian Carpets, taking place at LACMA's Bing Theater on November 24, 2009 at 7 p.m. Imaginary Knots is an original artistic performance and collaboration, which is presented in support of LACMA's A Tale of Two Persian Carpets: The Ardabil and Coronation exhibition at LACMA, November 14 to January 18, 2010. Possibly two of the largest, and oldest inscribed and dated carpets in the world, Ardabil carpets are cherished pieces of art, history and elegance all wrapped up in one – better yet, two. With gorgeous design and intricate elements, Ardabil carpets have spawned numerous look-a-likes. According to various accounts, the Ardabil carpets came into existence in northwestern Iran in the 16th century. Former Iranian ruler of the Safavid dynasty, Shah Tahmasp wanted the carpets to be created for the shrine of his ancestor, Sheikh Safi in the town of Ardabil. Now, almost 500 years later, the fine details and awe-inspiring beauty of these carpets make them extraordinary treasures. Measuring approximately 13' 5" x 23' 11" (Los Angeles) and 17' 6" x 34' 6" (London) and made up of silk foundation (warps and wefts) and wool pile, the Ardabil carpets are finely constructed with a variety of patterns and colors, such as red, blue and yellow. A gold medallion is at the center of the carpets, surrounded by smaller medallions located in the four corners of each rug. The medallion is very large, but not over powering. And although the sheer size of the carpets is mind boggling, it is the expertly weaved design running throughout each carpet that has everyone amazed. Since the carpets are so enormous, much care and attention to detail had to be involved when creating such masterpieces. Two lamps are expertly positioned above and below the center medallion. These lamp images give the appearance as if they were hanging from the medallion. And depending on where you stand, one of the lamps looks larger than the other. This rectangular-shaped carpet also contains an endless amount of additional scrollwork. This includes a variety of images of flowers or greenery, which also provide unmistakable appeal. These images dominate a large portion of the carpets and make up the deep blue background within the main area of each carpet. Until the late 1800s, there were still two complete Ardabil carpets existing in the shrine of Sheikh Safi. Unfortunately, there was an earthquake and the carpets were damaged. As a result, one carpet was used to repair the other one, leaving one, full-scale Ardabil carpet and a smaller, border-less carpet. 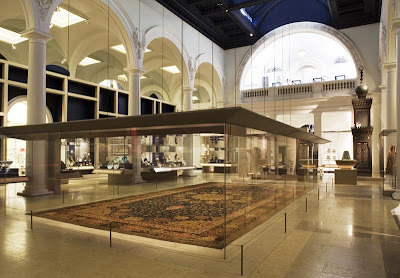 As of today, the bigger Ardabil carpet is currently housed at the V&A Museum in London. There, it lies flat in an enclosed glass case. The carpet is only lit periodically to prevent any color damage from lighting. The other carpet which is smaller in size is located in the Los Angeles County Museum of Art. This beautiful carpet will be on display from 10/14/2009 to 01/18/2010 in Los Angeles along with another piece of art called the Coronation Carpet..
Ardabil carpets have been through a myriad of difficulties over the centuries. What began as simply a royal commission, these carpets have become some of the most renowned carpets of their kind. And regardless of a complex history, natural disasters and near destruction of these attention-grabbing masterpieces, Ardabil carpets are truly in a class by themselves.